Ark Encounter will be a $150 million biblical theme park, scheduled to open in summer 2016. Set on 800 acres of Kentucky rolling hills, 40 miles south of Cincinnati, the centerpiece of the park will be an all-wooden re-creation of Noah’s ark, built to “Young Earth Creationist” specs from the text of Genesis 6:9. The completed ark will be built from three and a half million board feet of timber; stand 50 feet tall, 75 feet wide, 510 feet long (about 300 feet shorter than the RMS Titanic); and contain more than 100,000 square feet of exhibit space. The park is a joint venture between the creationist ministry Answers in Genesis (AiG) and the for-profit Ark Encounter, LLC. Founded in 1994, AiG is the same ministry that opened the $30 million Creation Museum in 2007. From October 2011 through June 2014, I conducted ethnographic fieldwork with the creative team leading the conceptualization and design of Ark Encounter. Park guests will progress through three decks filled with a mix of live animals, animatronics, interactive displays, multimedia exhibits, food vendors, and children’s play areas. Each deck will be organized by a particular affective experience. Deck One centers on the anxiety of Noah and his family following the closing of the ark door; the relief of escaping a terrifying storm tangled with the uncertainty of tomorrow. Deck Two portrays the tasks and challenges of everyday life on the ark. Noah and his family are settled, going about their liminal living: the daily grind of feeding animals, disposing of waste, and tending the onboard garden. Deck Three will capture the salvific realization that God’s wrath has been expended, the eight passengers spared, and the whole world now theirs. Ark Encounter is, among other things, a $150 million testimony. It is missionization, massively materialized, performed in the key of biblical literalism. But the Ark does not simply announce creationist theology. The creative team’s aim is to demonstrate the historical plausibility of the Genesis story. As their argument goes, if the ark can be built from wood now then Noah could have done it then. This miracle will be no less miraculous, just very doable. If it could have happened, then maybe it did happen, and if it did happen then the story is true—ratifying the whole of scripture. But plausibility alone is not enough. Noah’s story cannot merely be told; it must be felt. What was it like to see the door close? To hear the fierce storm outside? The cacophony of animals? What was it like when the dove did not return? To see the rainbow and be the center of God’s saving grace? An immersive experience promises to bridge the gap between plausibility and believability, and the logic of immersive entertainment is the primary engine for the team’s creative labor. The small team—just six members—is comprised of a creative director, an illustrator, a set designer, an exhibit fabricator, a technical designer, and a scriptwriter. All are Young Earth Creationists and all but two led the Creation Museum design. The group is exceptionally talented and accomplished. The creative director’s resume includes the 1984 Summer Olympics, the 1986 Statue of Liberty refurbishing, and major Universal Studios projects. The lead illustrator earned his industry chops with a Christian educational book company and a studio firm that contracts art production with major entertainment corporations like Milton Bradley and Fisher Price. The lead set designer earned a Master’s degree in theater design from the California Institute of Arts, the school Disney built. Such has been the ethnographic backbone of my fieldwork: creativity and art, being behind the scenes, design decision-making, negotiating divergent artistic visions, theming, immersion, and the pragmatic difficulties posed by budgets and deadlines. Fieldwork has been done almost entirely at the team’s office, in cubicles and boardrooms. I attended team meetings and sat with the artists while they work, savoring opportune moments to ask strategic questions. I understand the project to be a study in Christian cultural production: how does a team of creationist artists imagineer the biblical world of Noah in a way that attracts, appeals, and converts? Ark Encounter is also a matter of public religion, drawing together several senses of being “public.” First, it will have a certain highway visibility: the top portion of the ark itself will be (unavoidably?) seen from Interstate 75, which runs north-south, connecting two midsize American cities (Cincinnati, Ohio and Lexington, Kentucky). Then there is the project’s financial relationship to the State of Kentucky. While not directly subsidized by any state funds, Ark Encounter successfully applied for a conditional reimbursement of paid state taxes under the 2009 Kentucky Tourism Development Act. Lastly, there is a kind of public sphere being engaged, that of entertainment. Believers perform public religion through political acts of voting, monetary acts of donating, and charitable acts like assembling food pantries—but a consuming public flocking to a religious attraction is also public religion in action. Ark Encounter exemplifies Matthew Engelke’s recent critique, that “when we talk about ‘public religion’ today we’re often actually talking about ‘religious publicity.’” Through his ethnography of the British and Foreign Bible Society’s Bible Advocacy Team, and their work to increase the Bible’s presence in English public life, Engelke demonstrates that public religions must be actively made, produced, strategized, and advertised by distinctly situated religious actors. Ultimately, the religious publicity of Ark Encounter is about evangelism, elevating the visibility of Young Earth Creationism, and disrupting mainstream science’s authoritative claim on telling social and natural history by challenging evolution’s legitimacy. A key dynamic of Ark Encounter’s religious publicity is revealed through the creative team’s everyday labor. In figuring out their vision for the park and producing concept art to represent that vision, the team constantly imagines the publics who will be visitors to the park. Team meetings are highly polyvocal affairs; populated by acts of constructed dialogue in which team members perform the voices and stances of potential visitors. Projected scenarios of who will be standing in the ark, and what they will be saying about a particular exhibit, help structure pivotal artistic and design decisions. Consider some ethnographic examples toward this end. My first full day of fieldwork, November 2, 2011, was also the day of a six-hour team meeting, their first since deciding to open the park in phases. It was both very good luck and a shove into the ethnographic pool’s deep end! The creative director called it “a regroup meeting.” When I arrived, the team was seated in comfortable black pleather rolling chairs around a board room table. The walls were covered with “Concept Only” blueprints, the table littered with notepads, pens, yellow sticky notes, coffee cups, water bottles, Sharpies, lunch bags, architectural models of the ark, and Bibles (two versions: New King James and Henry Morris’ The Defenders Study Bible). The day was absolutely dizzying. I had met the team previously, but I knew hardly anything about them. I had not yet learned how to listen to each of their distinctive contributions. I had not yet learned their language of art, design, and park logistics. Still, amid the rapid exchanges and unfamiliar talk, one pattern was clear. Their discussion was filled with imagined interlocutors, mostly outside of (if not antagonistic to) their cause: “People think…,” “If I’m a skeptic…,” “For non-believers…,” “In people’s minds…,” “The Intelligent Design people…,” “To the secular world…,” “Evolutionists always say…,” and other variations. In imagining these publics, the team regularly circled back to two concerns (concerns that have since dominated many other fieldwork days). Travis’ constructed dialogue posits “people” at a crossroads, willing to be convinced but requiring certain explanations. The second concern is about an entertainment tension. On one hand, the team wants Ark Encounter to be a “family-friendly” park, where there will be “something for everyone.” On the other hand, they take seriously the task of showing “evil” in “the pre-flood culture of Noah’s day.” (After all, how do you depict the most sinful period in human history, the world God judged, in a way that will be fun for the whole family?) The difficulty of managing this tension of immersing families in evil scenes was neatly captured a few months later when Jon, the lead illustrator, worked on concept art for the “pre-show” film that guests will view before entering Deck One. 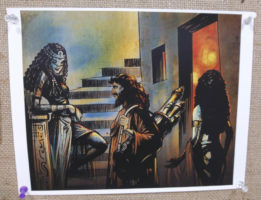 Jon was drawing a “temptation scene,” in which Noah, on his way to the ark after visiting a dying Methuselah, is approached by “two harlots” (see image above). As he worked, Jon explained that the main goal of this scene will be to show “seduction,” but in a way that is acceptable “for kids.” He liked the way his depiction of one woman’s partly exposed thigh had turned out; it was suggestive, but no more so than many G-rated films and advertisements in the public’s everyday media consumption. When studies of public religion are recalibrated as studies of religious publicity, these are the dynamics that become visible. In the case of Ark Encounter, the everyday creative labor that precedes acts of religious consumption includes the imagining of publics. Since that six-hour meeting in November 2011, I have identified four distinct publics the team hopes to attract. First, there are the devout: committed creationists who flood the Creation Museum and generally gobble up everything Answers in Genesis produces. Second, there are well-meaning Christians who remain “blinded” by “the lies” of evolutionary science. Third, there are seekers: the unaffiliated, the spiritual-but-not-religious, aware of creation-evolution controversies but not invested—certainly in need of salvation, but not the enemy per se. Finally, there are skeptics, creationists’ bête noir: dogmatic evolutionists and self-identified atheists (perhaps the same who wore Richard Dawkins t-shirts to protest the Creation Museum’s opening). Through the acts of constructed dialogue they voice, the team posits distinctive concerns for each of these publics. Though they differ, the audiences share at least one imagined imperative. They all must be entertained. They are a predisposed public, prepared to lose themselves in the kind of world-making that ties Star Trek to Batman to Lord of the Rings to Narnia. But they are also a discerning public, expecting Hollywood and Disney quality. If the team cannot meet the high bar set by secular productions, the conversion model of plausibility-immersion will not be achieved. Skeptics will remain skeptical; seekers still seeking; the lost still lost. In his book Caught in Play, the anthropologist Peter Stromberg argues that our shared culture of entertainment is “arguably the most influential ideological system on the planet.” While this appetite for fun unites the public, it is also a means of competing for the loyalty of publics. “As Darwin argued for the survival of the fittest, we now have survival of the most entertaining.” Ark Encounter might compete with other Christian theme parks for tourist dollars (for example, Orlando’s Holy Land Experience), but its ideological opponent is evolutionary science and its institutional infrastructure. Can Ark Encounter immerse and entertain in ways that trump natural history and mainstream science museums? In contrast to the hotly contested field of public school curricula, where symbolic capital derives from scientific legitimacy, can creationism score a victory in the court of public entertainment, where creative capital speaks in an artistic register? An ethnography of cultural production opens unique possibilities for addressing such necessary questions. James S. Bielo is Lecturer of Anthropology at Miami University. He is the author of Words upon the Word: An Ethnography of Evangelical Bible Study (NYU Press, 2009) and Emerging Evangelicals: Faith, Modernity, and the Desire for Authenticity (NYU Press, 2011), and the editor of The Social Life of Scriptures: Cross-Cultural Perspectives on Biblicism (Rutgers Press, 2009). As a teacher-scholar at Miami, Dr. Bielo primarily teaches courses in cultural and linguistic anthropology, ethnography, religion, American communities, and globalization. Read more posts at Reverberations. Thanks for this intriguing article regarding the “Ark Park.” As someone who grew up in south central Kentucky, home of Dinosaur World and Mammoth Cave (the largest cave system in the world), I find public religion in the region fascinating. I have a question regarding such religious publicity, do you think in a consumerist society economic success equals legitimization and validation for those planning/funding the park and its message? The creation museum has been a financial success (from what I read), but if it had not, could the venture and the message attached to it, lose some legitimacy? Or is the financial failure and potential for loss of legitimacy a prominent fear of the planners?